"Jurassic Bark" / "Crimes Of The Hot"
I got in an argument once with a friend over which was better: cats or dogs. My friend’s reasoning was, a cat is a ruthless, calculating predator, a hunter with only the barest trappings of domestication. A cat rarely comes when you call, and hardly ever seems happy to see you. A cat’s love, then, has to be earned. A cat won’t love just anybody, and that makes the affection it does show more valuable. Dogs? Dogs are easy. Dogs don’t take effort. A dog wags its tail at any idiot with a kind word. Well yeah, I told my friend. That’s the point. “Jurassic Bark” is not a typical episode of Futurama. It uses tricks the show has used in the past, but with a degree of naked manipulation and emotional directness that’s entirely new. The brutality of this half hour is simply astonishing. It’s a kind of brutality we almost never see on television, because it’s not particularly dramatic or shocking. It tells us nothing we don’t already know. Pets die, time passes, life moves on. Yet somehow, the discovery still comes like a revelation. The ending of this otherwise goofy, soft-hearted entry is more brutal than the Red Wedding, even though there is no violence in it. Most fictional catastrophes offer the unspoken comfort that this sort of thing? What you’re watching right now? Doesn’t happen here. You can walk away clean. But while most us won’t inadvertently desert a beloved dog after being cryogenically frozen, we can own a pet, and we can lose it. There’s no walking away from that. I said “Jurassic Park” is manipulative, and I stand by that; the way the episode exploits its flashback structure to build to the most devastating possible conclusion is about as subtle as that Sarah McLachlan SPCA ad. Acknowledging this isn’t the same as criticizing it, though. Manipulation fails when it becomes noticeable, and when the audience resents the efforts made to drive them towards certain feelings. 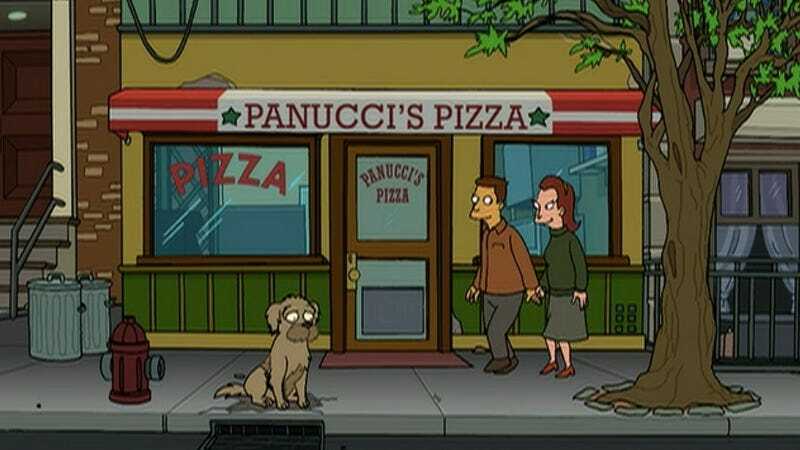 I can imagine a person being annoyed at the way Eric Kaplan’s script works to endear you to Seymour, the scrappy pooch Fry meets on the street after a prank call pizza delivery (the name is short for “Seymour Asses”). For me, the obvious affection shown towards the relationship between Fry and his dog makes that work forgivable, even admirable. Clumsy manipulation reveals a certain unearned arrogance, even contempt; look how easy it was for me to trick you, how vulnerable you are to control. This episode is more about empathy, and that ending—that uncompromising, agonizing ending—has no contempt in it. Just the knowledge that these things happen, and that we have to live with them. Re-watching this episode, the final moments color the preceding twenty or so minutes so thoroughly that it’s easy to forget there’s a Bender subplot. But there is! When Fry finds Seymour’s petrified corpse (okay, brief pause: there is something unshakably creepy about that stone dog. It’s recognizable enough that you can’t pretend it’s just a rock, and the constant cuts between Seymour-as-fossil and Seymour-alive-and-well work as a kind of mortality foreshadowing. ), Bender feels their friendship is threatened. This is largely because Bender has the emotional maturity of a three year-old, and while Fry is struggling with memories of his past and trying to find a way to bring Seymour home, Bender pretends like he doesn’t care in the most attention getting way possible. It’s all pretty cute, right up until the moment when Bender grabs Seymour’s petrified body and throws it into a pit of magma. (This makes sense in context.) But even this leads to something uplifting; once he gets over his gloating, Bender realizes that his actions hurt Fry’s feelings, and he risks his own life to get Seymour’s body back. This, then, is what would have been the emotional arc of a more conventional episode. Bender is selfish, acts impulsively, regrets his behavior, and then takes action to redeem himself. Everyone learns a valuable lesson about not being an insecure jerk. But Bender’s story really is secondary to the central action. Even Fry is secondary. 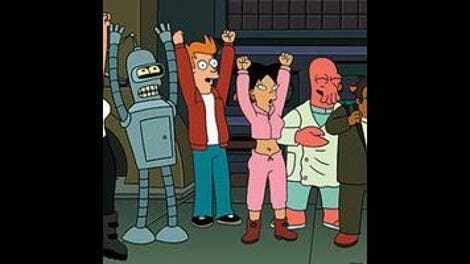 While his discovery of Seymour’s body and his anticipation over seeing his dog brought back to life (well, cloned back to life—Farnsworth has a Device) serve as a focus in the presence, Seymour dominates the flashbacks to the past; flashbacks which, once they pass the point where Fry was frozen, become largely from the dog’s perspective. Fry and Bender both make decisions, but Seymour’s the hero. When Fry goes to deliver a pizza to the cryogenics lab, Seymour knows something bad is going to happen, and when his master goes missing, Seymour’s the only one who figures out the truth. And his reward for his loyalty and resourcefulness is to die abandoned on a sidewalk. That loyalty—the familiarity of that loyalty, the fact that anyone who’s ever had a really good dog (or cat, okay fine) will know exactly what it feels like to have something small and furry be utterly devoted to you no matter how sloppy or self-centered or annoying you are—is part of what makes the ending so heartbreaking. But that’s obvious. What’s more subtle, and arguably more subversive, is the way the episode shows us a character making what seems to be the mature, responsible decision, and then immediately undercuts that decision in the saddest way possible. Fry, learning that Seymour lived twelve years after he was gone, decides not to clone him after all. Seymour lived a full life on his own, and, much as Fry might miss him, it wouldn’t be fair to try and bring him back into some new world just to make Fry happy. You can nitpick this decision if you want, but when it happens, it sounds like a rare moment of mature thinking from Fry; an act of self-sacrifices that allows for the acceptance of loss. Then we cut to Seymour waiting outside Panucci’s, and the music kicks in and Connie Francis starts singing, “If it takes forever, I will wait forever…” and oh hey, look at all the dust in this room right now, let’s take a moment and deal with that. I’ve tried six different times to write an appropriate concluding paragraph for this review, and I can’t seem to get it right. At a certain point, art resists analysis. I can explain to you the various reasons why the last minute or two of this episode remains one of the most gutting scenes I’ve ever watched on television, but I could never capture the feeling of watching it. We trust our fiction to tell us that bravery and determination and self-sacrifice will be rewarded, but sometimes they aren’t. Sometimes you can love something and make the right choices, and still end up alone. I guess that’s important or something, but right now, all I really want is to hug the dog I had when I was twelve, because I miss her a lot, and isn’t funny how that feeling never really goes away. The scene of Seymour messing around at Panucci’s, getting fur on the dough and swimming in the sauce (among other things) is hilariously gross. In order to protest a museum’s refusal to give him Seymour’s remains, Fry resorts to dance: the Hustle, as described in Dances Of The Ancient Bronx. I can’t decide if Leela and Amy’s hand-to-hand combat outfits are fan service or ironic fan-service. Well, how about something a little more light-hearted: the slow man-made destruction of our planet’s climate. Thankfully, “Crimes Of The Hot” is considerably zanier than “Jurassic Bark,” with no gutpunch of an ending waiting to leave you sobbing on your couch. (Not that this is what happened to me.) (I don’t own a couch.) From a quick filmstrip explaining the concept of global-warming in the broadest possible terms to Al Gore’s head to every robot venting its exhaust simultaneously into the sky, this half hour has it all. I mean, Nixon trades the headless body of Spiro Agnew to Professor Wernstrom for use of his giant mirror satellite. I’m not sure what else you could really ask for. Oh look, it’s Farnsworth, Farnsworth is to blame for everything. He designed a robot with an inefficient exhaust system when he was working for Mom as a young(ish) inventor, and every robot since then has followed some iteration of his original plans. Which sort of makes sense, I guess, so long as you’re willing to believe that a future with seemingly inexhaustible ingenuity and resources didn’t bother to innovate off of a fifty plus year old design. Actually, never mind, that sounds perfectly plausible. But it does have that curious feeling of limitation that happens in episodes of the show which aim for a broader scope, as though there are only a few hundred people on the entire planet, and only a handful of them are worth giving lines to. There’s also a struggle to pick a central character to focus on. You’d think Farnsworth would be the nominal hero, given that he’s the one that got everyone into trouble in the first place, but after admitting his guilt, and failing on the Halley’s Comet plan, he disappears from the episode, only to show up in the final moments with a plan that can save everyone. So he technically makes up for his short-sightedness, but the moment doesn’t feel earned in the slightest. The scenes that would normally be about Farnsworth struggling to accept what he’s done, and figuring out the best way to move forward, don’t have him around at all. Maybe that’s okay, though, given that we’ve already seen him dealing with his potential obsolescence and incompetence in the past. And his absences gives us time to follow the closest thing the story has to a lead: Bender, who befriends a turtle when he sees footage of the poor animal flipped on its back, unable to right itself. Bender has a dark secret—he, too, is incapable of righting himself once he’s on his back. It… Well, actually, it doesn’t make a darn bit of sense, given that Bender has arms, and also given that this has never come up on the show before that I can remember (although it’s possible I missed it). Plus, as character arcs go, it isn’t much of anything to write home about. The sight of Bender carrying around a turtle like it’s his new best friend is adorable, but there’s no real resonance to this plot and the larger storyline of robots being responsible for global warming. The obvious center for the story is the potential flaming death of all life on the planet. This is, as the kid’s say, a pretty darn good hook. Bender’s place in that story should be about making the larger threat more personal, but the expected connection never actually arrives. There’s some suspense when Bender falls on his back and almost ruins everything, and it’s cute when the turtle manages to roll itself back into place, thus teaching Bender a valuable lesson about physics, but it’s a concept that doesn’t feel specific to the situation outside of immediate context. The forced effort to give Bender something to overcome feels, well, forced. Still, like I said, “Crimes Of The Hot” is a hoot to watch, and there’s enough novelty (Al Gore is Emperor of the Moon! Hedonism-bot! And I seriously don’t think I’ll ever get tired of headless Spiro Agnew.) to hold one’s attention. Plus, it’s refreshing to see a show deal so openly with the concept of global warming, especially one that’s over a decade old. Sure, it’s filtered through an absurd framework, but that filmstrip explaining what global warming actually means is, while rudimentary and not exactly scientifically accurate, at least lays out a basic concept. Having Al Gore do a second guest spot helps to lend the whole thing an air of credibility—a very thin air, admittedly, but it’s enough to give the whole outing a little more charge than it might otherwise have had. Thankfully, this is an issue that no longer has any practical relevance to humanity whatsoever. We have solved the problem of global warming by never inventing any awesome robots to muck up the environment. And thank goodness protecting the environment and creating a sustainable ecosystem for future generations never turned political. Boy, we have dodged so many bullets here, ha ha. Impressive how everyone survived Nibbler’s chlorine gas belch. I love Bender’s reaction. The old solution to global warming? Dropping a giant ice cube into the ocean. It’s a light Zoidberg week this week, but he does get to figure out Nixon’s secret plan to destroy all the robots. Admittedly, he figures it out after everyone else does, but still, at least he’s keeping busy.